← Things that make me go GAH! I have to finish this one by June 7th, so this is my first priority right now. I was stalled on how to handle my goof, but then I looked at it some more and decided that the buttonholes were a little too far apart (the perils of knitting the buttonbands at the same time as the body of the sweater). The bad news was that fixing that meant dropping the 4 stitches of the buttonbands back quite a few rows. Blargh. The good news is that the new buttonhole is exactly opposite my goof, so I can just sew the button over it and go on my merry way. Cheating? Yes. But I can live with that! I am knitting this baby sweater out of KnitPicks Comfy yarn. This is the first time I’ve used this yarn, and I must say: it is very aptly named. It’s one of the softest yarns I’ve ever used. After so much time working on the Scalloped Lace Baby Sweater, I’m a bit tired of knitting with cotton yarn. But this yarn is a blend of cotton and acrylic, and manages to take the best qualities of both to create a yarn that is machine washable, soft, and much easier on the hands than pure cotton. This might be my go-to yarn for baby knitting from now on. I can’t decide if I like the green stripes or not. I found some adorable buttons on Etsy that are brown and blue with a bit of pale green, but they haven’t arrived yet, so I’m not sure if this is quite the right green. I had some Knit Picks Shine Worsted that I bought for another project in a bright green, so I tried to use that to add a hint of green to go with the buttons, but I’m not sure I like it. Next to the brown, the stripes look more yellow than green. I have another skein of Comfy on the way in a paler green, so if I like that better, I’ll rip the last few rows and redo with that color. 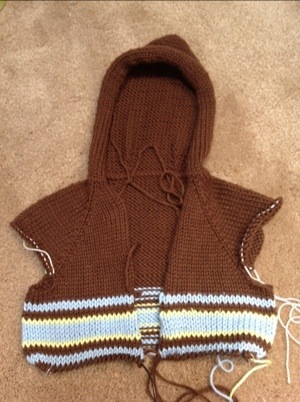 This project is on hold now until buttons and yarn arrive, hopefully later this week. Lastly, I have a fun new toy! I am writing this post on my new iPad. (I took the photos with it, too.) I’m still getting used to the touchscreen keyboard (and I might end up getting one of the cases with the built-in keyboard eventually), but I’m excited to play with some of the iPad knitting apps that some of you have recommended to me. 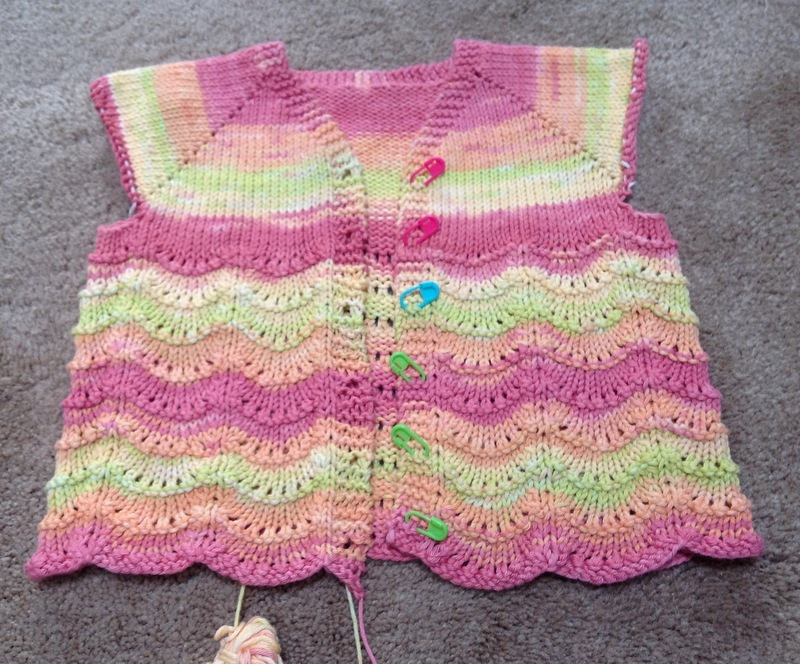 Posted on May 30, 2012, in knitting, projects, WIP Wednesday, yarn and tagged buttons, Scalloped Lace Baby Cardigan, Striped Baby Hoodie. Bookmark the permalink. Leave a comment.